Which tropical destination is the right one for your honeymoon? We would say that probably 70% of My Vacation Lady‘s honeymooners want to go somewhere tropical and beach-y for their dream honeymoon. There’s a lot of beach out there in this world so we really need to narrow it down a bit. It’s a big world and there are a lot of great tropical beach destinations. How can you decide? That’s where My Vacation Lady comes in. Our job is to help you figure out which tropical beach destination is the right one for your dream honeymoon. Our in depth consultation will help us visualize your dream honeymoon. 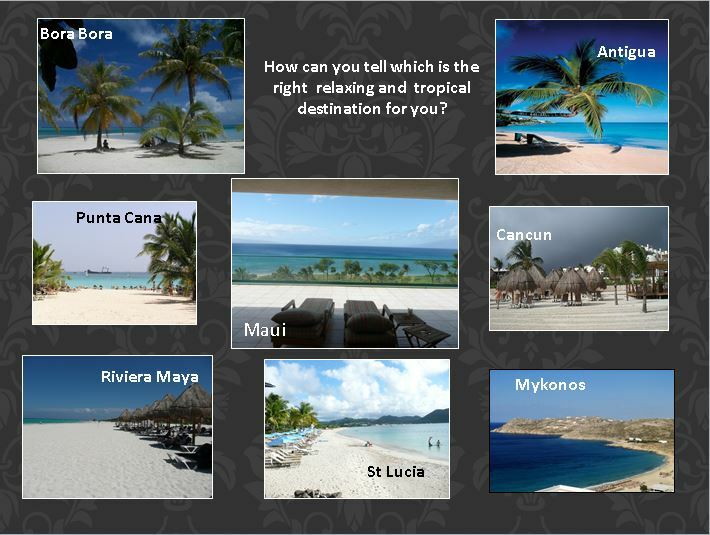 We ask a lot of questions about the resort, type of beach and the experiences you want. Do you want an all inclusive resort? Do you want a high rise, a boutique resort, or does it matter? My Vacation Lady is one of the few honeymoon specialists out there that will do such an in-depth consultation. We take the time to get to know you. You might call another travel agent and speak to them for 2-3 minutes and they are already making suggestions. They may be basing it on what they like to sell—- not necessarily what is the best destination for you. My Vacation Lady is the top rated honeymoon specialist located in New Jersey according to the brides on Wedding Wire and the Knot. We won’t be the first to tell you that your honeymoon should be special, but we are the right honeymoon specialists to make it special. Contact My Vacation Lady to see how our unique personalized approach to honeymoon planning services can make a difference in your honeymoon experience!